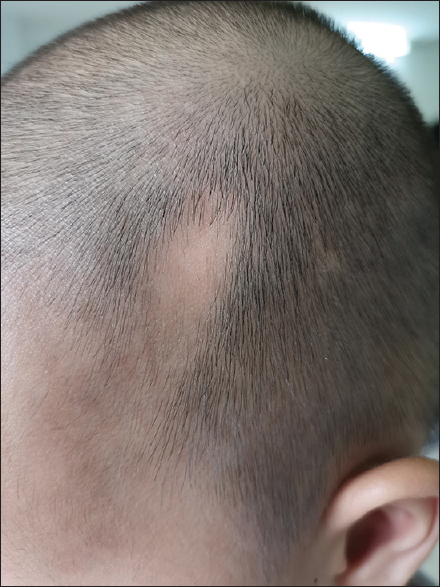 A 2-year-old Chinese boy was referred to our clinic because of alopecia over his left frontotemporal area from birth. He was delivered at term by spontaneous vaginal delivery, without any instruments or fetal scalp electrodes being used during delivery, with no history of trauma over his scalp, and without being subjected to therapeutic intervention for the alopecia. His general physical examination and past medical record were absolutely normal. A skin examination revealed a obvious patch of alopecia over the left frontotemporal region of his scalp [Figure 1]. The patch was triangular to oval and approximately 3.0 cm × 1.5 cm in size. Fine vellus hairs were present in the bald area, without perifollicular inflammation and scarring. The margin of the alopecia patch was clear cut. Hair pull test was negative. On dermoscopic examination, the alopecic area contained normal follicular openings with exclusively vellus hairs (the terminal-vellus ratio was 2.8:97.2) [Figure 2]. No yellow spots, exclamation mark hairs, or dystrophic hairs were detected. Based on the distinct clinical appearance and medical history, a diagnosis of congenital triangular alopecia (CTA) was made. In 1905, Raymond Sabouraud first described CTA, a circumscribed, noncicatricial alopecia of unknown pathogenesis. CTA usually appears at 2–5 years of age, with about one-third of the cases noticed at birth. Its actual incidence is believed to be underestimated because only a few patients seek medical attention and many patients are misdiagnosed. Clinically, CTA is asymptomatic and typically affects the frontotemporal region. Most patients with CTA present with unilateral hair loss. However, bilateral cases can occur. A noninvasive examination tool, dermoscope, is very helpful for the diagnosis and differential diagnosis of CTA. Dermoscopy would reveal normal follicular openings and vellus hairs in the patch of alopecia in the absence of yellow and black spots and dystrophic hairs. These features distinguish CTA from other noncicatricial circumscribed alopecias that occur in infants including aplasia cutis congenita, alopecia areata, and trichotillomania. There is no specific treatment for CTA. Therefore, it is important for clinicians to be aware of this condition in order to facilitate proper diagnosis and avoid unnecessary treatments. Surgical excision of the alopecia lesion may provide a cosmetic recourse. CTA remains unchanged throughout life. It might be interesting to imagine that the alopecic area of CTA maintains vellus island for decades, whereas the surrounding terminal hairs undergo life-long cyclic transformations under the influence of potent hair cycle modulators (transcription factors, growth factors, cytokines, neuropeptides, enzymes, and circadian clock). It must be also emphasized that hair follicles in the alopecic area of CTA are miniaturized and are replaced by vellus hair follicles histologically, a characteristic similarly observed in androgenetic alopecia (AGA). CTA also provides opportunities to interrogate the complex regulation of hair follicle cycle and patterned transformation. Therefore, a greater understanding of hair follicle cycle and patterned transformation regulation may pave the way for the development of novel therapies for CTA and AGA. The authors are very grateful to Professor V.J. Hearing for help with the English language editing. The work was supported by the National Natural Science Foundation of China (Grant No. 81673078). Leung AK, Barankin B. Incidence of congenital triangular alopecia. An Bras Dermatol 2016;91:556. Fernández-Crehuet P, Vaño-Galván S, Martorell-Calatayud A, Arias-Santiago S, Grimalt R, Camacho-Martínez FM, et al. Clinical and trichoscopic characteristics of temporal triangular alopecia: A multicenter study. J Am Acad Dermatol 2016;75:634-7. Karadağ Köse Ö, Güleç AT. Temporal triangular alopecia: Significance of trichoscopy in differential diagnosis. J Eur Acad Dermatol Venereol 2015;29:1621-5. Al-Nuaimi Y, Hardman JA, Bíró T, Haslam IS, Philpott MP, Tóth BI, et al. A meeting of two chronobiological systems: Circadian proteins period1 and BMAL1 modulate the human hair cycle clock. J Invest Dermatol 2014;134:610-19.